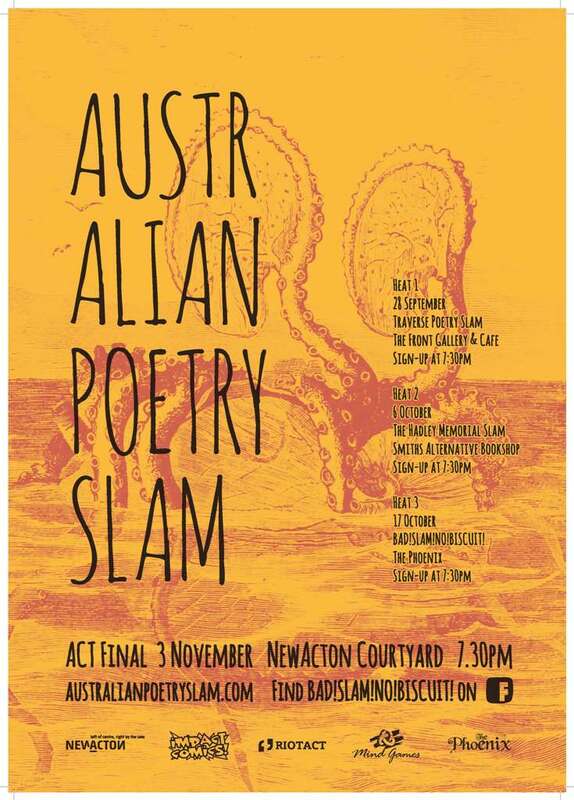 THIS IS THE INVITATION TO THE AUSTRALIAN CAPITAL TERRITORY (ACT) AUSTRALIAN POETRY SLAM HEAT NUMBER ONE! Heat Number One will be held at The Front Gallery and Cafe and is brought to you by your friendly BAD!SLAM!NO!BISCUIT! Team. THE MASTER OF CONFLICT – WHO HATES POETRY BUT LOVES POETS – WILL BE AN MC AT THIS EVENT SO YOU SHOULD BE THERE TOO! YOU SHOULD ALSO BRING YOUR POEM TO PERFORM, OR ALL YOUR JUDGEMENT FOR THE JUDGING! Sign-up opens at 730pm and closes when The Score Adder says it is closed! Not only is there all that, but we have a special guest Sacrificial Poet in the formation of THE FLYING V! A Canberra writer and performer, Bela has featured at BAD!SLAM!NO!BISCUIT! and Cannibal Kittens showcases. With The Tragic Troubadours he has performed at the Canberra Fringe, National Folk, and YouAreHere festivals. He is also studying for a degree in Writing from the University of Canberra and writes poetry and short plays. He also has an understanding of Chair Guy. 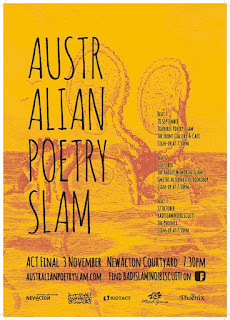 There are exciting special rules for this Australian Poetry Slam Heat, go to http://australianpoetryslam.com/ to read them. Details of heats two and three, as well as the final, can be found there too. BAD!SLAM!NO!BISCUIT! which can normally be found in The Phoenix Pub on the third Wednesday of every month! Thank you sponsors: Impact Comics, The RiotACT, Mind Games Canberra, The Phoenix Pub, and NewActon.